2 of my lucky Cupcakez will win $50 worth of Neutrogena products! Read about the Neutrogena Pink Grapefruit line here! This giveaway is open to U.S. only. 2. If you are under 18 please get consent from your parent/guardian. 3. Leave a comment with your NAME and EMAIL. SUBSCRIBERS: PLEASE USE THE EMAIL YOU SUBSCRIBED WITH. If you are uncomfortable leaving your email address in a comment you can email me.. Click "contact" at the top for my contact info. 1. Blog about this giveaway OR add it to your sidebar. Leave a comment below with the link. "RT @PiinkCupcakez Enter for your chance to win $50 worth of Neutrogena products! http://www.PiinkCupcakez.com"
Leave a comment below with your FB link or name. Make sure you have followed all of the rules correctly! Those who don't will be disqualified. Disclaimer: This giveaway is being sponsored by Neutrogena. oooh I adore Pink Grapefruit, I'd love to try this, thanks girl! I follow on GFC. 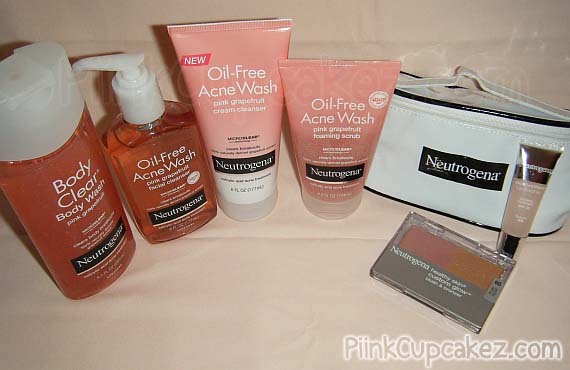 OMG i'm obsessed.com with Neutrogena. I followed via MakeupNotDown on Google connect and RT'd on twitter via MakeupNotDown. i know this contest was form forever ago...but could you please delete my comment (girlcurly96)....I am geting a lot of spam recently.